Description: Chione. Here is a duplicate 35mm color slide via Al Chione that was taken at Bay Head Junction, New Jersey, perhaps in 1954. The photographer is not identified. Shown here is Pennsylvania Railroad engine #1361, a K-4S (4-6-2) "Pacific" built in Juniata during May of 1918, retired in September of 1956, enshrined at the Horseshoe Curve on 8 June 1957, and restored for excursion service in April of 1987. Description: Here is a postal card entitled "Pennsylvania 1361." No Postmark. Caption On Reverse: "Famous K-4 locomotive, the Pacific that was on display at Horseshoe Curve near Altoona, Pa., is shown at Monmouth Park Race Track near Oceanport, N.J., July 6, 1954 during its final days on the New York & Long Branch. 1361 is now owned, in the mid 1980's, by the Railroaders Memorial Museum in Altoona, and has been restored to operating condition for special events. Photo by Robert F. Collins." Description: Here is a postal card entitled "Pennsylvania 1361." No Postmark. Caption On Reverse: "Class K-4 Pacific locomotive speeds along the New York and Long Branch R.R. between South Amboy and the northern New Jersey shore, May 17, 1955. This locomotive is now on display at the world famous Horseshoe Curve, Altoona, Pa. Photo by Jim Kelly." Description: Sweetland. Here is a duplicate 35mm color slide of a photo by Mr. David R. Sweetland that was taken in Camden, New Jersey, in August of 1955. Shown here is Pennsylvania Railroad engine #1361, a K-4S (4-6-2) "Pacific" built in Juniata during May of 1918, retired in September of 1956, enshrined at the Horseshoe Curve on 8 June 1957, and restored for excursion service in April of 1987. Description: Chione. Here is a duplicate 35mm color slide via Al Chione that was taken in South Amboy, New Jersey, during 1956. The photographer is not identified. Shown here is Pennsylvania Railroad engine #1361, a K-4S (4-6-2) "Pacific" built in Juniata during May of 1918, retired in September of 1956, enshrined at the Horseshoe Curve on 8 June 1957, and restored for excursion service in April of 1987. Description: Chione. Here is a duplicate 35mm color slide via Al Chione that was taken in Bay Head Junction, New Jersey, on 28 April 1956. The photographer is not identified. Shown here is Pennsylvania Railroad engine #1361, a K-4S (4-6-2) "Pacific" built in Juniata during May of 1918, retired in September of 1956, enshrined at the Horseshoe Curve on 8 June 1957, and restored for excursion service in April of 1987. Description: Chione. Here is a duplicate 35mm color slide via Al Chione that was taken in Bay Head Junction, New Jersey, in May of 1956. The photographer is not identified. Shown here is Pennsylvania Railroad engine #1361, a K-4S (4-6-2) "Pacific" built in Juniata during May of 1918, retired in September of 1956, enshrined at the Horseshoe Curve on 8 June 1957, and restored for excursion service in April of 1987. Description: Here is page four of a five-page article by David P. Morgan entitled "Shades Of Steam And Speed By The Seashore." It was published originally in the April 1957 issue of "Trains" magazine, page 47. Photo by Philip R. Hastings. Photo Caption: "Elements of the K-4 at Bay Head Junction, N.J." Shown here is a partial view of Pennsylvania Railroad engine #1361, a K-4S (4-6-2) "Pacific" built in Juniata during 1918, retired in September of 1956, enshrined at the Horseshoe Curve (near Altoona) in June of 1957, and restored for excursion service in April of 1987. Description: Coal Power. Here is a commercial photo of a Pennsylvania Railroad steam locomotive taken at the Juniata Erecting and Machine Shop in Altoona, Pennsylvania, during June of 1957. Shown here is PRR engine #1361, a K-4S (4-6-2) "Pacific" built in this very building during May of 1918 for passenger-only service. 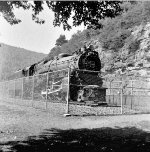 This photo was taken just before it was enshrined at the Horseshoe Curve on 08 June 1957. That's a difference of 39 years! During 1987 and 1988, engine #1361 was restored for service, and made some excursion runs in Central Pennsylvania. Certain safety concerns arose, however, which led to it being disassembled. It has yet to be reassembled/restored/resurrected! Commercial photo; photographer's name unknown. 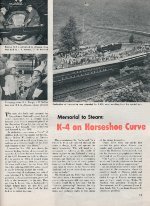 Description: Here is a one-page article entitled "K-4 on Horseshoe Curve." It was published originally in the July-August 1957 issue of "Pennsy" magazine, page 15. Shown here is Pennsylvania Railroad engine #1361, a K-4S (4-6-2) "Pacific" built during 1918 and retired in May of 1956. The ceremony to honor those who built and operated the PRR's fleet of steam locomotives took place on Saturday, 08 June 1957. Description: Here is a photo taken by Mr. Bud Rothaar. 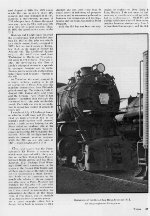 It was published originally in the October 1957 issue of "Trains" magazine, page 8. Partial Caption: "In her 39 years of service, K-4 No. 1361 rolled up mileage equivalent to 100 trips around the world." #1361 is a K-4S (4-6-2) "Pacific" built in Juniata during May of 1918, retired in September of 1956, enshrined at the Horseshoe Curve on 8 June 1957, and restored for excursion service in April of 1987. Also visible on the right is a pair of unidentified Baldwin-built "Centipedes" proceeding around the Curve and down to East Altoona where they will begin yet another helper/pusher run up "The Mountain." Description: Horseshoe Curve-1959. Here is an original photo that I took at the Pennsylvania Railroad's Horseshoe Curve near Altoona, Pennsylvania, during August of 1959. Shown here is PRR engine #1361, a K-4S (4-6-2) "Pacific" built during 1918 and retired in May of 1956. Those were the good old days when women wore heels, skirts, and earings to the Curve! Description: AHC. Here is a duplicate 35mm color slide via Al Chione that was taken at the Pennsylvania Railroad's Horseshoe Curve near Altoona, Pennsylvania, perhaps during 1959. The photographer's name is not recorded. Shown here are two Baldwin-built "Sharks" pulling a mixed-cargo freight train around the Curve and up the Allegheny Mountains to Gallitzin and points West. Also visible on the right is PRR engine #1361, a K-4S (4-6-2) "Pacific" built in Juniata during May of 1918, retired in September of 1956, enshrined at the Curve on 8 June 1957, and restored for excursion service in April of 1987. Description: Here is page three of a five-page article by Don Wood entitled "Piggyback Performance: Pennsy's TT1." It was published originally in the July 1960 issue of "Trains" magazine, page 48. Bottom Right Photo: Shown here is Pennsylvania Railroad engine #1361, a K-4S (4-6-2) "Pacific" built in Juniata during 1918 and retired in May of 1957. It was enshrined at the Horseshoe Curve on Saturday, 08 June 1957. Description: Here is page four of a five-page article by Don Wood entitled "Piggyback Performance: Pennsy's TT1." It was published originally in the July 1960 issue of "Trains" magazine, page 49. Bottom Left Photo: Shown here is Pennsylvania Railroad engine #1361, a K-4S (4-6-2) "Pacific" built in Juniata during 1918 and retired in May of 1957. It was enshrined at the Horseshoe Curve on Saturday, 08 June 1957. Description: Horseshoe Curve-1961. 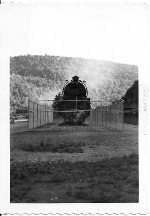 Here is an original photo that I took of a Pennsylvania Railroad steam locomotive at the Horseshoe Curve near Altoona, Pennsylvania, on 17 August 1961. Shown here is PRR engine #1361, a K-4S (4-6-2) "Pacific" built during 1918 and retired in May of 1956. It was put on display at the Curve on 08 June 1957. 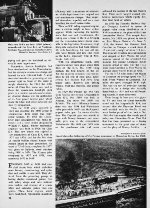 Description: Here is page eight of an eight-page article by Fred Westing entitled "The Great Days of Steam and the Glory of Pennsy Pacifics." It was published originally in the March 1965 issue of "Railroad" magazine, page 28. Top Photo: Shown here is Pennsylvania Railroad engine #3750, a K-4S (4-6-2) "Pacific" built in Juniata during 1920. This locomotive has been restored and is now on exhibit at the Railroad Museum of Pennsylvania in Strasburg, Pennsylvania. Bottom Photo: Shown here is Pennsylvania Railroad engine #1361, a K-4S (4-6-2) "Pacific" built in Juniata during 1918 and retired in May of 1957. It was enshrined at the Horseshoe Curve ~ near Altoona, Pennsylvania ~ on Saturday, 08 June 1957. Description: Rainy. Here is an original photo that I took of a Pennsylvania Railroad steam locomotive at the Horseshoe Curve near Altoona, Pennsylvania, on 12 October 1965. Shown here is PRR K-4S (4-6-2) "Pacific" #1361. It was put on display at the Curve on 08 June 1957. Description: Horseshoe Curve-1966. Here is an original photo that I took at the Pennsylvania Railroad's Horseshoe Curve near Altoona, Pennsylvania, during mid-May of 1966. Shown here are three PRR engines pulling a westbound mixed-cargo freight train around the apex of the Horseshoe Curve. Also visible is PRR K-4S (4-6-2) "Pacific" #1361, plus lots of budding trees! Description: Horseshoe Curve-1966. Here is an original photo that I took at the Pennsylvania Railroad's Horseshoe Curve near Altoona, Pennsylvania, during mid-May of 1966. Shown here is PRR engine #1361, a K-4S (4-6-2) "Pacific" that was enshrined here on 08 June 1957. Description: Zak. Here is an original 35mm color slide by Mr. Martin Zak that was taken while riding in a Pennsylvania Railroad passenger train around the Horseshoe Curve near Altoona, Pennsylvania, in September of 1966. Shown here (R to L) are PRR engines #4224 and two more E-7's whose numbers are not recorded. #4224 is an EP-20 built by GM-EMD in 1948 and rated at 2,000 HP; its original PRR number was "5864." The train is traversing the Curve on its way down the Allegheny Mountains to Altoona and points East. Also visible on the right is PRR engine #1361, a K-4S (4-6-2) "Pacific" built in Juniata during 1918, retired in September of 1956, enshrined at the Curve in June of 1957, and restored for excursion service in April of 1987. 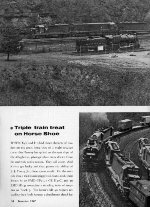 Description: Here is page one of a four-page camera study entitled "Triple Train Treat On Horse Shoe." 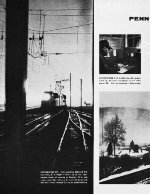 It was published originally in the December 1967 issue of "Trains" magazine, page 18. Photos by J.J. Young, Jr.; text by David P. Morgan. Top Photo: In the foreground is PRR engine #1361, a K-4S (4-6-2) "Pacific" built in Juniata during May of 1918, retired in September of 1956, enshrined at the Curve on 8 June 1957, and restored for excursion service in April of 1987. In the background are three PRR engines pulling a westbound TrucTrain: #2358, #6517, and #6167. #2358 is an EF-25 built by GM-EMD in March of 1965 and rated at 2,500 HP. #6517 is a GF-25A built by GE in December of 1965 and rated at 2,500 HP. #6167 is an EF-36 built by GM-EMD in January of 1967 and rated at 3,600 HP. Bottom Photo: On the left is PRR engine #2358 heading the westbound TrucTrain. In the center are two pusher locomotives on the end of a stalled train; one's unidentified, the other's PRR engine #6089 ~ an EF-30A built by GM-EMD in March of 1966 and rated at 3,000 HP. Also visible is PRR N-5C cabin car #477843. Description: Here is a postal card entitled "Sleeping Giants." No Postmark. Caption On Reverse: "Sleeping Giants. A view of World Famous Horseshoe Curve on the former Pennsylvania Railroad's 4-Track Mainline, 5 miles West of Altoona, Pennsylvania. Pennsylvania Railroad's K-4 locomotive #1361 sleeps, as does the East Slope of the Allegheny Mountains. (K-4 #1361 has since been moved to the Railroaders Memorial Museum, Altoona, Pennsylvania.) Photo courtesy of David W. Seidel." The date is an approximation. 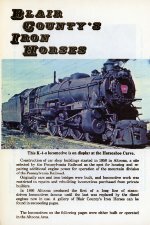 Description: Here is a postal card entitled "Horseshoe Curve." No Postmark. Caption On Reverse: "Eastbound locomotives passing the Pride & Joy of the P.R.R. K-4s #1361 on the world famous Horseshoe Curve." Pictured on the left is Pennsylvania Railroad engine #1361, a K-4S (4-6-2) "Pacific" built in Juniata during May of 1918 and retired in September of 1956 after 38 years of faithful service. Pictured on the right are Penn Central Railroad engines #6040 and perhaps two other units whose numbers are not recorded. #6040 is an SD-40 built (for the PRR) in February of 1966 and rated at 3,000 horsepower. The photographer's name and the date are not recorded. Description: Horseshoe Curve-1973. Here is an original photo that I took at the Penn Central Railroad's Horseshoe Curve near Altoona, Pennsylvania, during August of 1973. Shown here is Pennsylvania Railroad engine #1361, a K-4S (4-6-2) "Pacific" built during 1918 and retired in May of 1956. Posing next to it are my friends Twyla Jean King and Charles Ottaviano of Middletown, PA. 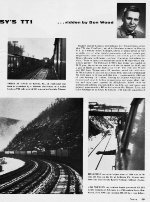 Description: Here is page 31 of a 64-page booklet published by Harry P. Albrecht entitled "World Famous Horseshoe Curve, Altoona, Pennsylvania Railroad." It was issued originally during September of 1973. Shown here is PRR engine #1361, a K-4S (4-6-2) "Pacific" built in Juniata during 1918 and retired in May of 1956. Photo taken on 08 June 1957, the rainy day it was enshrined at the Curve. 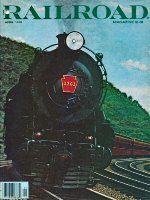 Description: Here is the backt cover of a 64-page booklet published by Harry P. Albrecht entitled "World Famous Horseshoe Curve, Altoona, Pennsylvania Railroad." It was issued originally during September of 1973. Shown here is a rear view of the tender for PRR engine #1361, a K-4S (4-6-2) "Pacific" built in Juniata during 1918 and retired in May of 1956. 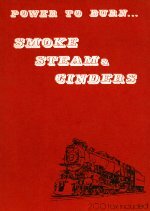 Description: Here is the front cover of a 96-page monograph entitled "Power To Burn: Smoke, Steam, & Cinders" that was edited by James M. Shafer and published during 1976. 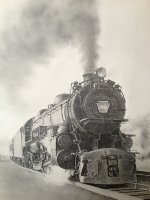 Depicted in relief is Pennsylvania Railroad engine #1361, a K-4S (4-6-2) "Pacific" built in Juniata in May of 1918, retired in September of 1956, and enshrined at the Curve on 8 June 1957. Description: Here is page one of a 96-page monograph entitled "Power To Burn: Smoke, Steam, & Cinders" that was edited by James M. Shafer and published during 1976. Photo Caption: "This K-4s locomotive is on display at the Horseshoe Curve." Pennsylvania Railroad engine #1361 is a K-4S (4-6-2) "Pacific" built in Juniata during May of 1918, retired in September of 1956, and enshrined at the Horseshoe Curve on 8 June 1957. Description: Here are pages 80-81 of a 96-page monograph entitled "Power To Burn: Smoke, Steam, & Cinders" that was edited by James M. Shafer and published during 1976. This is an aerial view of "The World Famous Horseshoe Curve." Visible at the apex is Pennsylvania Railroad engine #1361, a K-4S (4-6-2) "Pacific" built in Juniata in May of 1918, retired in September of 1956, and enshrined at the Curve on 8 June 1957. Description: Here is page 25 of a 40-page booklet published by Harry P. Albrecht entitled "A Picture Study Of The K-4." First issued in October 1967, revised in September 1976. Implied Section Caption: "The Memorial Locomotive." All of these photos show Pennsylvania Railroad engine #1361, a K-4S (4-6-2) "Pacific" built in Juniata during May of 1918, retired in September of 1956 after 2,469,000 revenue miles, enshrined at the Horseshoe Curve in June of 1957, restored for excursion service in April of 1987, withdrawn for safety reasons, disassembled for repairs, and still awaiting resuscitation. Description: Here is page 26 of a 40-page booklet published by Harry P. Albrecht entitled "A Picture Study Of The K-4." First issued in October 1967, revised in September 1976. Section Caption: "The Memorial Locomotive." Shown here is Pennsylvania Railroad engine #1361, a K-4S (4-6-2) "Pacific" built in Juniata during May of 1918, retired in September of 1956 after 2,469,000 revenue miles, enshrined at the Horseshoe Curve in June of 1957, restored for excursion service in April of 1987, withdrawn for safety reasons, disassembled for repairs, and still awaiting resuscitation. Description: Here is page 27 of a 40-page booklet published by Harry P. Albrecht entitled "A Picture Study Of The K-4." First issued in October 1967, revised in September 1976. Section Caption: "The Memorial Locomotive." Shown here is Pennsylvania Railroad engine #1361, a K-4S (4-6-2) "Pacific" built in Juniata during May of 1918, retired in September of 1956 after 2,469,000 revenue miles, enshrined at the Horseshoe Curve in June of 1957, restored for excursion service in April of 1987, withdrawn for safety reasons, disassembled for repairs, and still awaiting resuscitation. Also visible in the foreground is PRR passenger coach #4231. Description: PRR K-4 Pacific 1361 rests at the Horseshoe Curve on May 22, 1977. A gift from the PRR to the city of Altoona, 1361 was placed at the Curve "permanently" after her retirement in 1957.Her presence would be eclipsed this day by the run through of RDG 4-8-4 #2102 and Cuyahoga Valley Line 2-8-2 #4070. Description: While PRR K-4s 1361 watches, CR SDP45 6691 (ex-EL 3660) and SD45-2 6660 (ex-EL 3675) roll down Horseshoe Curve for another helper assignment in July, 1978. Description: A pair of SD45's, with a caboose mate, push hard on a TV train climbing Horseshoe Curve in August, 1979. Description: CR U33B 2896 leads a quartet of U-boats as they pull a TV train up Horseshoe Curve in August, 1979. Description: A former PC SD40 leads an SD40-2 with a TV train up Horseshoe Curve in August, 1979.